The town of Goslar sits on the northeast edge of the Harz mountains. For hundreds of years it was a prosperous mining town and wealth poured in from the silver mine of Rammelsberg just on the outskirts. 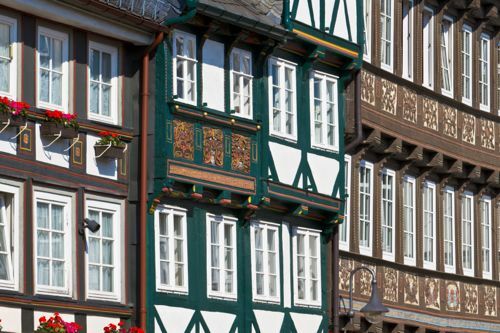 Street after street of beautifully-carved, half-timbered houses are the result. 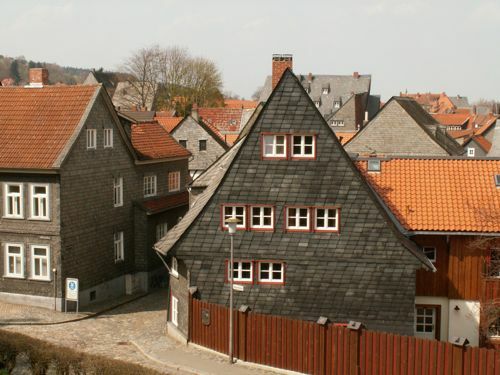 In fact, this town has the largest number of old houses in Germany, 1800 of them! Not only was Goslar a wealthy mining town, but the Holy Roman Emperors made this city their residence for 300 years, starting in 1039. This small town of 46,000 was one of the most important places in Germany for centuries. The Rammelsberg mine was also the major source of copper for Europe during the Middle Ages. The city survived the war without damage due in part to the presence of a POW hospital and is an amazingly well-preserved example of a town of the late middle ages. 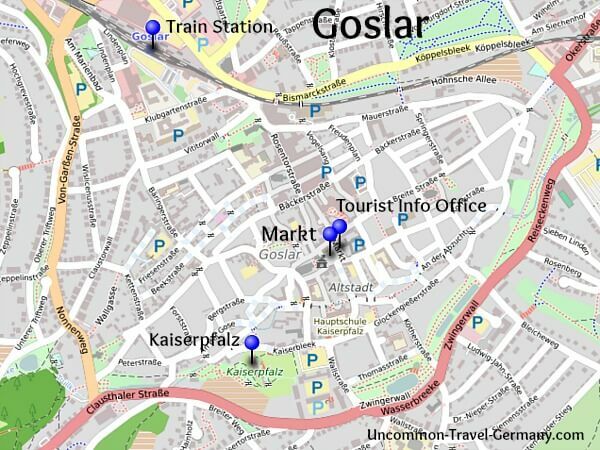 Goslar ended up in West Germany after the war, unlike most of the other Harz towns, so it was maintained better over the years compared to the places that found themselves east of the border. 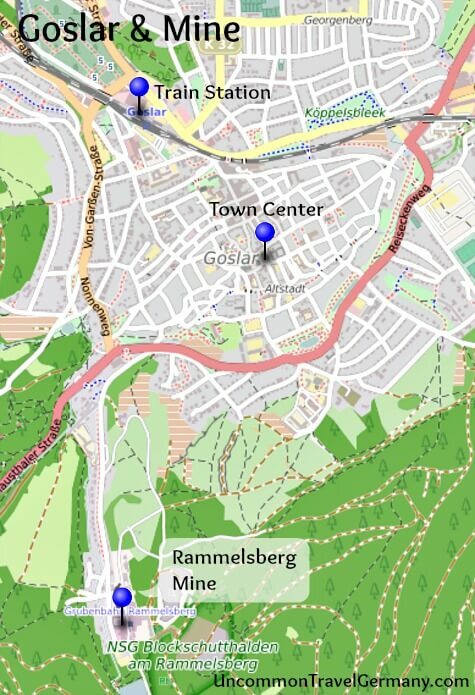 The Rammelsberg mine and the entire city were declared UNESCO World Heritage sites because of their importance. 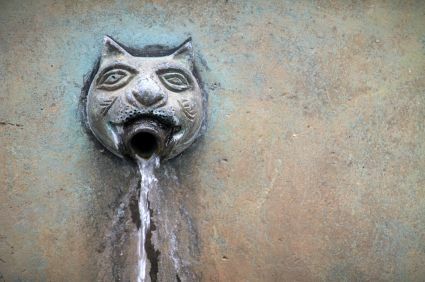 This is a wonderful town for strolling through the winding streets and admiring the well-preserved, picturesque houses. Many of the townspeople decorated their houses with elaborate (and sometimes rather naughty) wood carvings. You'll find angels, demons, animals and mythological creatures alongside human figures, and some startlingly crude characters. The main square, the Markt, has some interesting examples. 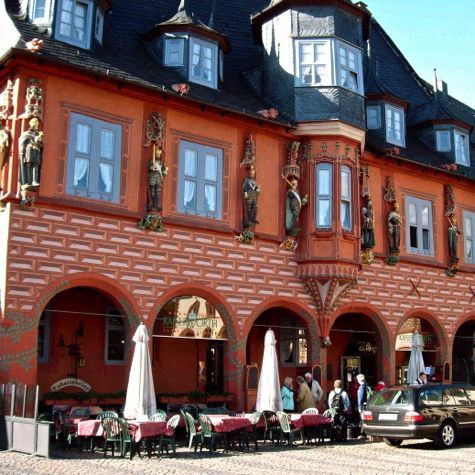 The 500 year old Kaiserworth Hotel was the official home of the tailors' guild. A line of German emperors marches across the building. Also prominently displayed is a man excreting a gold coin! He's not the only bare-bottom on the Markt, either. The Brusttuch House, another hotel, was the home of a prosperous burger. There is a riot of carved wooden figures across the upper levels; red devils, angels, a dignified lady riding a goat and the famous (or infamous) Butter Hannah, a charming young lady casually scratching her behind while churning the butter! It looks pretty much the same now as it did in the photo taken in 1900. Clearly the Puritan mindset never got a grip on the citizens of Goslar. One would kind of expect these carvings to be placed discretely inside the house. But no, they are boldly fixed on the exterior for all the townsfolk to enjoy. A surprisingly modern approach. Make sure you take a walk along the small stream that goes through the town past other exquisite little houses. The Rathaus, also on the Markt, is a good example of a medieval hall. It's worth a visit inside to see the beautiful starry blue ceiling and Gothic frescos on the walls. The Kaiserpfalz is the royal palace down Hohenweg street from the Markt. 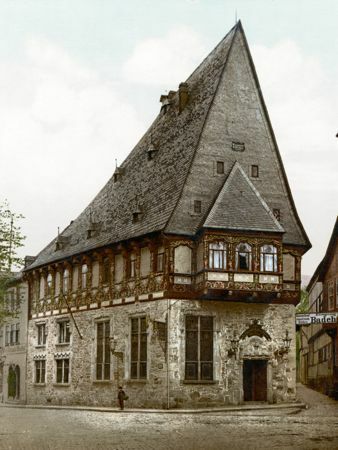 This building was built in the eleventh century by Heinrich III, and was where the German Emperors held court for several centuries during the middle ages. 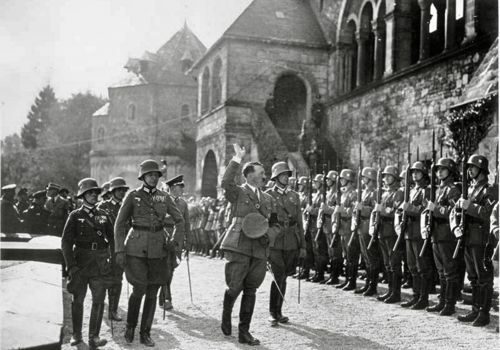 During the Third Reich, the town's historical importance as the seat of the German emperors made it an attractive location for political ceremonies. A small building across the lawn from the palace houses the bronze throne used by the emperors of the first "Reich" and much later by Kaiser Wilhelm of the second one. Also on the Markt is the Glockenspiel, a clock tower where a procession of mechanical figures re-enact the history of Goslar at 12, 3, 6, and 9 p.m. every day. This old mine is a fascinating place. 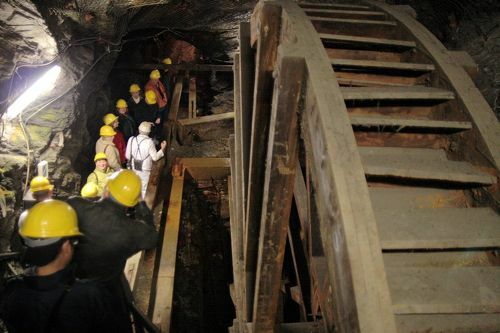 It had been in operation for over 1000 years, closing in 1988 when it finally ran out of ore. For centuries, tons of silver, copper and zinc were pulled out of the mountain just outside of town. 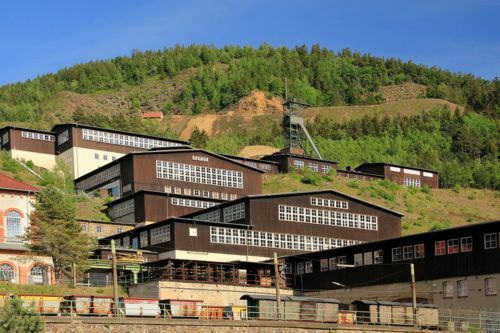 Rammelsberg was the source of most European copper for many years and the silver from this mine made Goslar a very wealthy town. There is a large and interesting mining museum above ground demonstrating the techniques and tools of mining. The best part is the tour of the mine itself. You can join a group and put on coveralls and a hard hat and go down deep into the mountain where the walls are dripping water. From there you can ride the miniature train the miners used to zoom through the narrow tunnels. At one point you get out and experience the dark, dank atmosphere the miners worked in. The mine is easy to get to. You can arrange for an English tour at the Tourist Information Office (on the Markt) and take bus #C from the town center. Or you can drop in and take the German tour. It's only a short bus ride to the outskirts of the town. Both the Kaiserworth Hotel and the Brusttuch House (of the notorious carvings) are possibilities if you want to be right in the center of things, but don't mind paying a premium for location and atmosphere. Another possibility is a very pleasant pension in a quiet residential area a short walk from the Bahnhof. I stayed at the Gästehaus Möller at Schieferweg 6, about a ten minute walk from the town center. It is run by Frau Christa Merschel and the rooms are very comfortable with high ceilings and lots of lace. The breakfasts were scrumptious and included in the 35 Euro price. The house is a large, turn-of-the-century building in a wooded setting with a lovely garden in the back. I was also greeted by a friendly orange cat on the front steps. Highly recommended. See map below. For an ultra charming spot, try the Wortmühle, a rustic mill on a stream turned into a restaurant and beer garden. In addition to local specialties, they serve game dishes (wild boar, venison, bison!) and home-brewed beer. They are two blocks from the Markt at Worthstrasse 4. (Check out the photos at worthmuehle.de). Another suggestion is the Paulaner-Wirthaus at Gemeindehof 3-5. This quaint, half-timbered pub is located in a former tanner's house. You can sit inside, out in front at the sidewalk cafe or in the beer garden in the back. Sehr gemütlich. 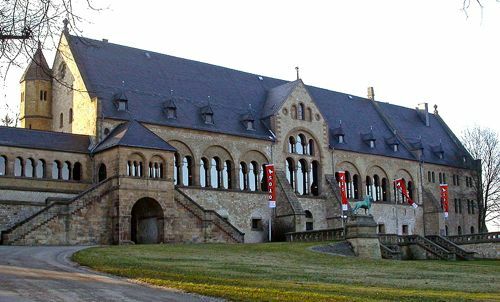 For how to get to Goslar, go to Travel to the Harz.